For the week ending November 29, clear conditions early in the week gave way to rain, sleet, snow and colder temperatures late in the week. Corn harvest continued to creep along in Panhandle counties, where melting snow and high grain moisture levels limited progress. Topsoil moisture supplies rated 5% very short, 18% short, 73% adequate, and 4% surplus. Subsoil moisture supplies rated 5% very short, 23% short, 70% adequate, and 2% surplus. Winter wheat condition rated 6% poor, 31% fair, 54% good, and 9% excellent. Pasture and range conditions rated 3% very poor, 8% poor, 30% fair, 54% good, and 5% excellent. For the week ending November 22, snow blanketed western counties early in the week and northeastern counties over the weekend, according to the USDA’s National Agricultural Statistics Service. Rain preceded the snow in many areas with an inch or more common in the eastern two-thirds of the state. Fieldwork came to a halt as soils became too wet or snow covered to work. Harvest was near completion in most areas except for the Panhandle. Temperatures averaged above normal across the east and below normal in western areas. There were 3.7 days suitable for fieldwork. Topsoil moisture supplies rated 5% very short, 21% short, 71% adequate, and 3% surplus. Subsoil moisture supplies rated 5% very short, 25% short, 69% adequate, and 1% surplus. Corn harvest was 95% complete, equal to last year, and near the five-year average of 97%. Sorghum harvest was 95%, near 96% last year and 99% average. Winter wheat condition rated 0% very poor, 6% poor, 31% fair, 54% good, and 9% excellent. Pasture and range conditions rated 3% very poor, 8% poor, 30% fair, 53% good, and 6% excellent. Stock water supplies rated 2% very short, 11% short, 86% adequate, and 1% surplus. Strahinja Stepanovic, Nebraska Extension Educator in Perkins, Chase, and Dundy Counties: Corn harvest has been very slow this year due to wet conditions. 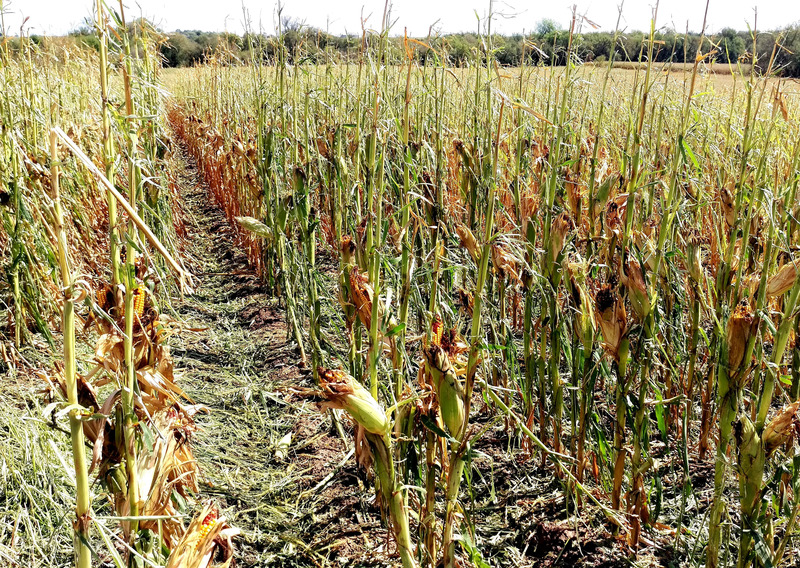 It started mid-September with picking high-moisture corn and some farmers are still trying to get it out of the field. We are seeing some field corn and especially popcorn hybrids dropping ears and lodging, reducing yields up to 20% in some cases. More corn grain in residue can cause founder/acidosis in cows if such fields are grazed during winter. Research shows that if ear drop is more than 8 bu/ac, sodium bi-carbonate should be added to water at a rate of 2.5 lb/100 gal. Another problem is controlling volunteer corn in the succeeding crop. If you had significant ear drop this year, glyphosate herbicides will not effectively control volunteer corn next year. 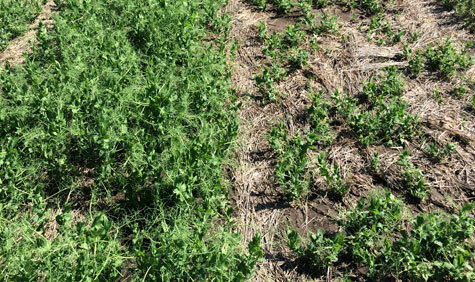 Consult with your local Extension Educator or crop consultant to select herbicides that will eliminate this problem. Temperatures averaged 6-8ºF above normal across the northeast and 2-4º elsewhere, according to the USDA’s National Agricultural Statistics Service report for the week ending Nov. 15. Rainfall of up to an inch was recorded across portions of the eastern third of the State, with lesser amounts elsewhere. 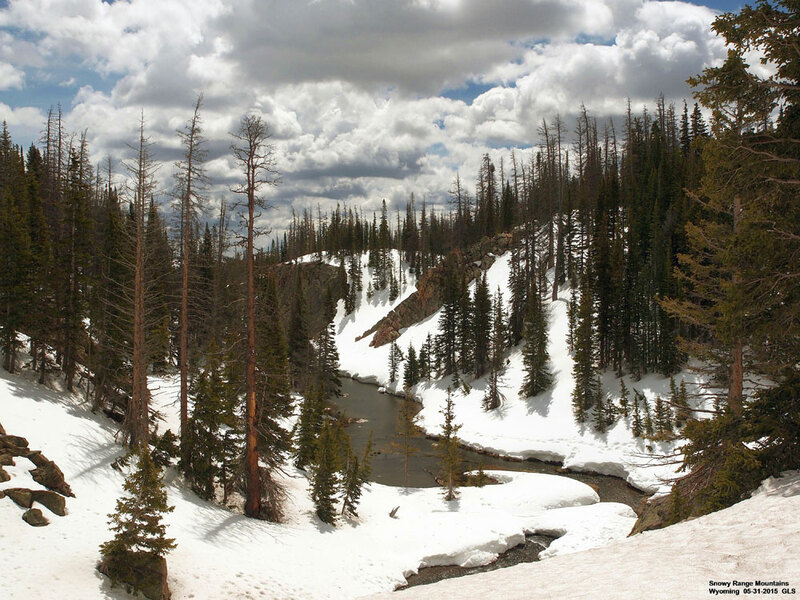 Snow was recorded in central and southwestern counties with harvest progress slowed at midweek. 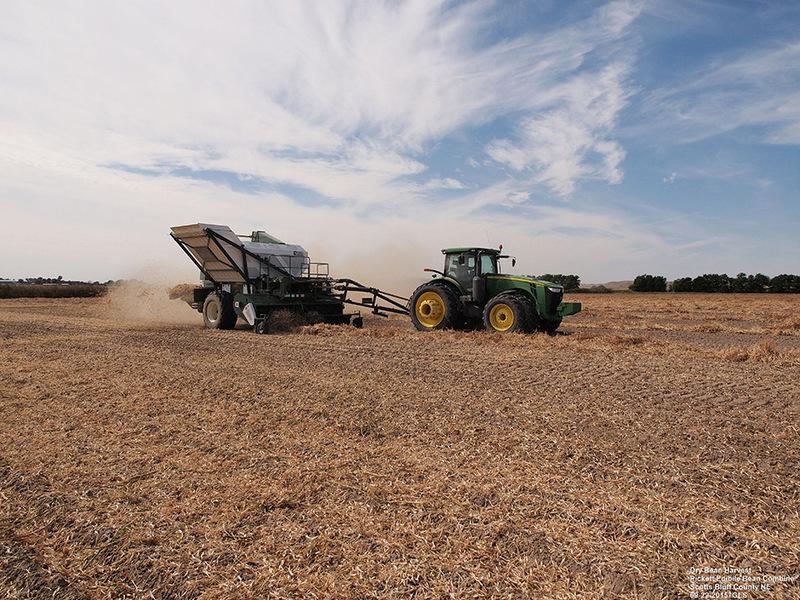 Producers with harvest complete were working on fall tillage, fertilizer applications and livestock care. Topsoil moisture supplies rated 6% very short, 26% short, 67% adequate, and 1% surplus. Subsoil moisture supplies rated 6% very short, 28% short, 65% adequate, and 1% surplus. Corn harvest was 92% complete, near last year's 89% for this period and the five-year average of 94%. Sorghum harvest was 93% complete, near 92% last year and 96% average. Winter wheat condition rated 0% very poor, 5% poor, 31% fair, 56% good, and 8% excellent. Pasture and range conditions rated 3% very poor, 8% poor, 29% fair, 54% good, and 6% excellent. See previous USDA NASS reports by week in the 2015 CropWatch Archive. With conventional dry bean harvest, more typical in the southern Panhandle, dry beans are cut, windrowed, and dried some in the field. Gary Stone, Extension Educator at the Panhandle Research and Extension Center in Scottsbluff: Dry/edible bean harvest is underway in the Panhandle and western Nebraska. More than half of the crop has been harvested. Producers cut and windrow the beans early in the morning while the vines are damp, to minimize pod shatter. The windrowed beans are allowed to dry for one to three days and then combined. Yields of 45 to 50 bushels per acre have been higher than expected, despite growing conditions this season. Market classes include Great Northern, pinto, navy, kidney and black turtle. So, if you like your baked beans, ham and beans. and bean salads, the Panhandle of Nebraska is where they may come from. Remember, happiness is a crock of beans. 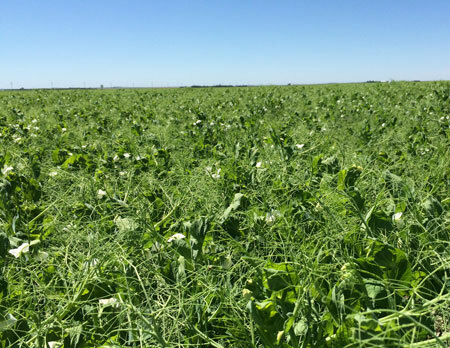 Gary Stone, Nebraska Extension Educator: Yellow field pea harvest has been completed for several weeks now and dry bean and corn silage harvest are in full swing. With our annual "normal" frost/freeze date in the Panhandle approaching, producers are getting their corn silage chopped and piled. The photo is at our Panhandle Research and Extension Center corn silage production fields. The silage will be used for feeding trials at the Panhandle REC feedlot, north of Scottsbluff. Factoid: In Nebraska in 2014 260,000 acres of corn were harvested for silage, according to the January 2015 Crop Production Summary from the USDA National Agricultural Statistics Service. Average yield per acre was 21 tons, leading to a total yield of 5,460,000 tons. Nebraska ranked 10th in the nation in total corn silage production. 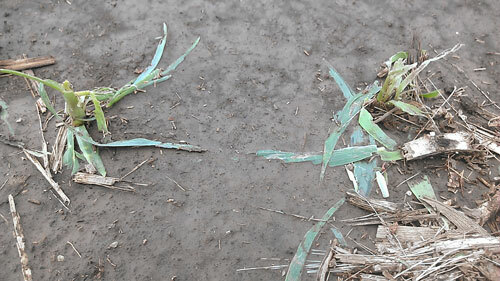 Corn leaves were completely stripped from their plants in this south central Nebraska field. This week a series of storms moved through south central and eastern Nebraska, ravaging corn and soybean fields just as they neared maturity. To address the particular challenges of these fields, Nebraska Extension educators will be holding a storm damage information meeting this Monday near Gladstone. See this week's CW article for more information. 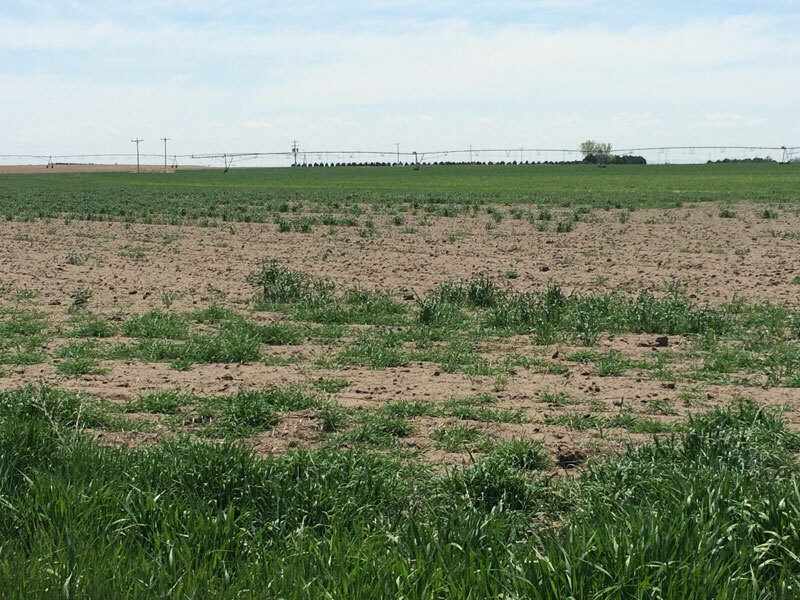 Strahinja Stepanovic: Cropping Systems Extension Educator in southwest Nebraska: It has been three weeks since we had our last rain in southwest Nebraska and all dryland crops are showing signs of drought. Reference evapotranspiration (ET) in the Upper Republican NRD ranged from 1.6 inches in Perkins County to 2.9 inches in southwest Dundy County. This means that crops in southwest Dundy County used about 1.5 inches of water more than in Perkins County. See attached image for more details on ET and rain data as well as crop growth stages and their water use coefficients for this period. According to the US Drought Monitor, none of the counties in southwest Nebraska are in abnormal drought, which means these conditions are (believe it or not) normal in southwest Nebraska this time of the year. According to 30-year weather data, average August precipitation and ET are 2.50 and 9 inches, respectively. This means that August weather conditions were very near the long-term average. Gary Zoubek, Extension Educator in York County: While we missed out on the significant rainfall events last week, my ETgages only dropped about 0.95 inch for the week. If corn is fully dented, the crop coefficient of is 0.96; if not fully dented, it remains 1.1 so water use for the most mature corn was 0.91 inches for the week or 0.13 inch/day. For the later maturing crops water use was 1.05 inch for the week or 0.15 inch/day. With the warmer temperatures predicted for this week, ET will increase some. For the latest crop water use or ET go to nawmn.unl.edu/ and click on view weekly ET data. 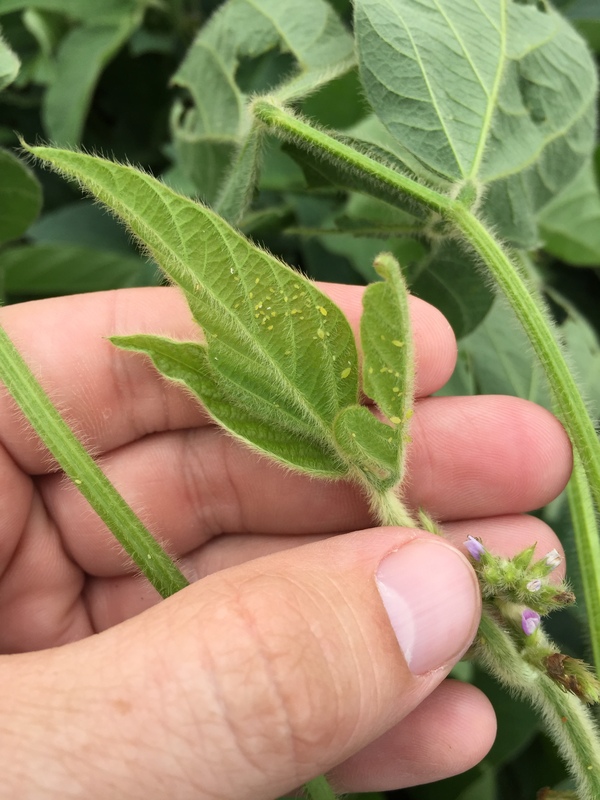 Keith Jarvi, Extension Educator in Thurston counties: You can't get any better weather than what we've seen the last two weeks for soybean aphid growth. Growers should be monitoring their fields as populations could explode and can double in three to four days. We probably haven't seen this much treatment activity for several years in this area. Near Plainview populations were pushing over 1,000 aphids per plants close to R6. After about 3-4 weeks, populations can crash just as quickly. We're seeing some soybean diseases (brown stem rot and phytophthora), but probably not at treatable levels. The threshold for soybean aphids is 250 aphids per plant and increasing at R3-R and 400-500 per plant at R5. Depending on the population number, in some cases, even at the R6 growth stage, treatment may get a yield response. Price of beans may also be a consideration. (Left) Figure 1. 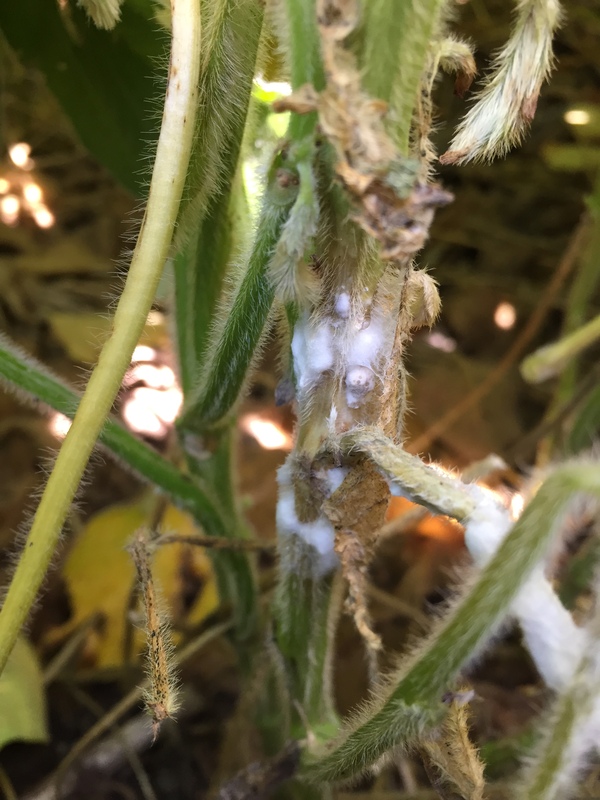 White mold more common this year due to wet weather during flowering. Nathan Mueller, Cropping Systems Extension Educator for Dodge/Washington Counties: August 16-18 rainfall totals ranged from 2 to 5 inches across the Dodge and Washington counties bringing a likely end to the irrigation season for many. Rainfall totals were lowest around Fremont and highest around Scribner. Most corn is between the dough (R4) and dent (R5) stages. Disease pressure from southern rust, gray leaf spot, and northern corn leaf blight caused many producers to spray fields during the milk and dough growth stages the last two weeks. 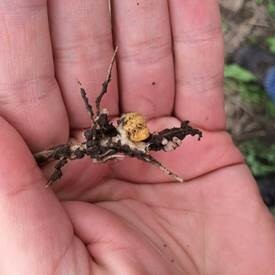 There has also been several reports of higher than normal northern corn rootworms beetle populations (likely extended diapause) in corn after soybean fields this month. Many growers across northern Dodge County only irrigated 1 to 2 inches this season and some fields were not irrigated at all. Overall, most of the corn crop is in good to excellent condition. Rainfed corn yields of 220 bu/ac will likely be obtained in portions of northern Dodge and Washington Counties. Figure 3. 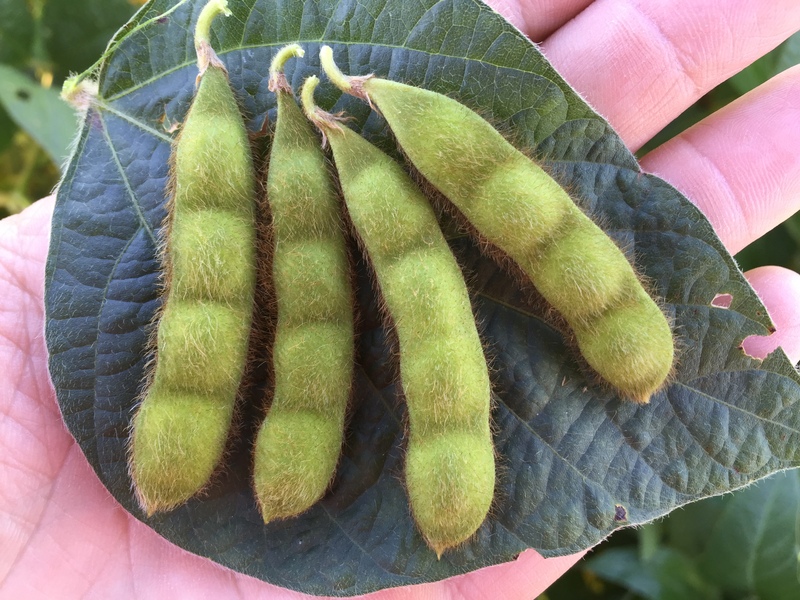 More 4-seed soybean pods than normal this year. Most soybeans are in beginning seed (R5) growth stage. More incidences of white mold (Figure 1), Phytophthora stem rot, and frogeye leaf spot have occurred this year compared to last year. Foliar symptoms of sudden death syndrome just started to appear this past week on compacted end rows. Soybean aphid populations (Figure 2) have been gradually climbing over the past three weeks, with some hot spots within fields with over 250 aphids per plant. However, soybean aphid pressure across most fields has not justified insecticide applications so far. Many farmers have been worried about how tall the soybeans grew this season and the risk of lodging. 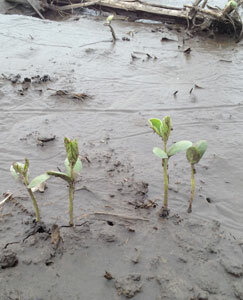 Unfortunately, heavy rains and strong winds from storms this week caused many soybean plants to lodge. Some yield loss will be attributed to this lodging. Overall, soybeans are in good to excellent condition. I have been finding more four-seed pods (Figure 3) this year than normal, so yield potential looks good. Scout for soybean aphids and remember 250-80-6. This means the economic threshold is 250 aphids per plant on greater than 80% of the plants in a field with an increasing population prior to the full seed (R6) growth stage. 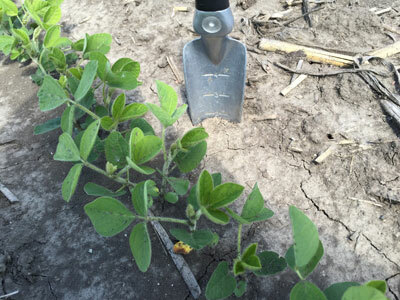 Scout and take notes on your soybean fields to help prioritize variety selection for disease resistance (white mold, Phytophthora, and sudden death syndrome) when planting back into these fields next time. 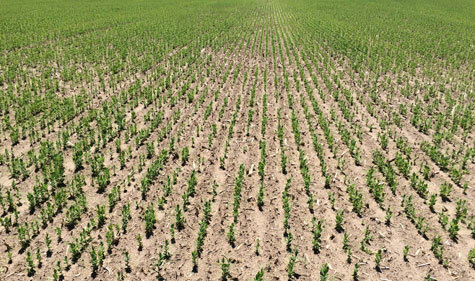 Scout and take notes on fields or portions of fields with waterhemp and marestail escapes to make adjustments next spring for increased pressure. Attend upcoming seed industry plot tours to learn how certain corn hybrids handled this year's disease pressure (gray leaf spot and northern corn leaf blight). Ask! Keith Glewen, Extension Educator in Saunders County: You know it is summer as we get our share of calls from folks who are angry about their gardens and sweetcorn being sprayed unintentionally by aerial and ground rig spray applicators. We encourage those with complaints to visit first with the applicator before contacting the Nebraska Department of Agriculture. The challenge facing some growers is whether to spray a fungicide for the control of corn leaf diseases. The economic payback with $3.50 corn, favorable weather conditions for development of certain disease pathogens, and the lack of treatment thresholds for some of these disease pathogens makes the decision difficult. John Wilson, Extension Educator in Burt County discusses how to avoid spray drift in this week's Crop Tech Cafe blog. He notes that while drift may not be eliminated, it can be reduced and it's the applicator's responsiblity to avoid it. See these practical tips for limiting drift. The Crop Tech blog is written by several extension educators in northeast Nebraska. 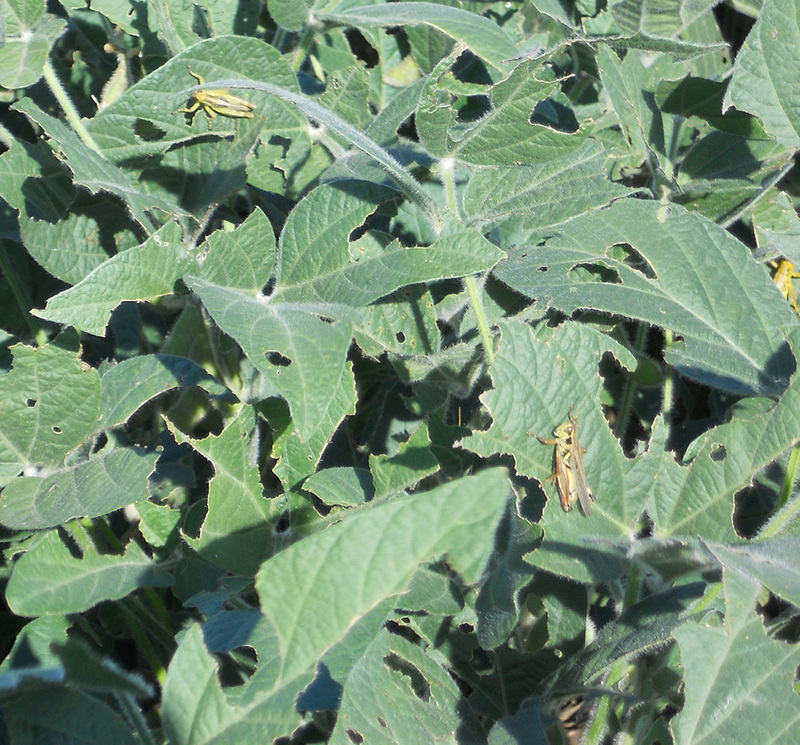 An array of foliar-feeding insects are now in soybean fields in Dodge and Washington counties (Figure 1). 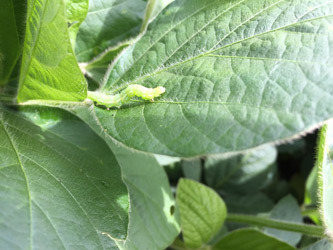 It is sometimes hard to determine the% defoliation and to identify which insects are causing the defoliation in your soybean crop. 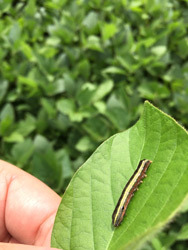 As soybeans begin to set pods, an insecticide treatment generally is warranted when the combined defoliation from all pests approaches 20% and active feeding is still occurring. However, most people tend to overestimate the defoliation. 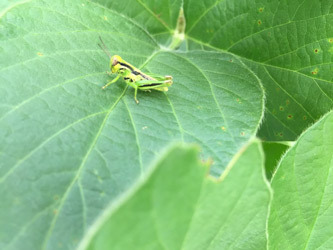 For more information on local crop pests in Dodge and Washington counties, please visit Crop Tech Cafe. Figure 5. At left, reference ET values (red) and precipitation values (blue) for three counties in southwest Nebraska: Perkins (top), Chase, and Dundee. 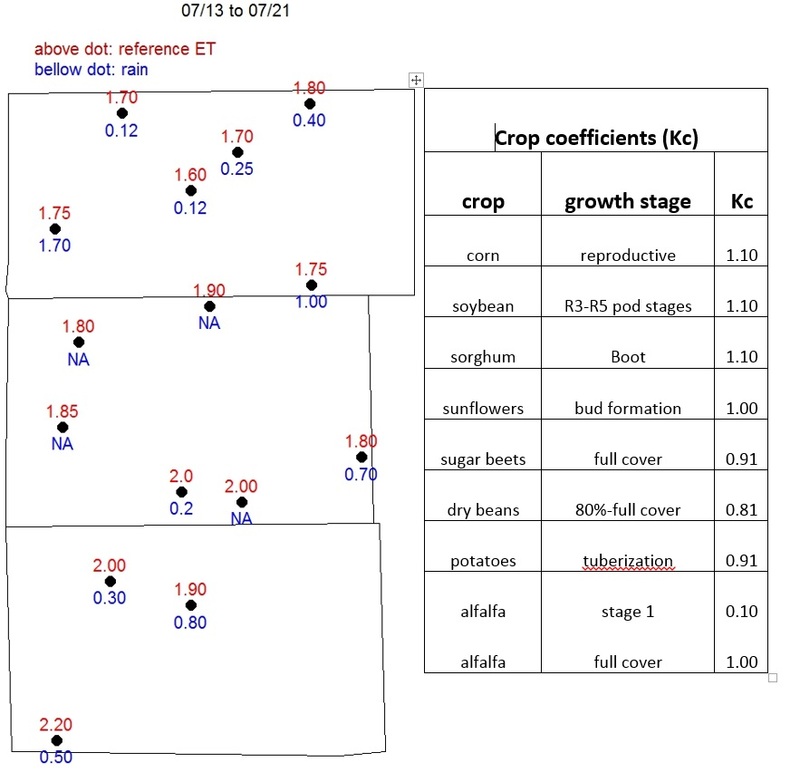 Use with the crop coefficient (right) for the specific crop stage to estimate evapotranspiration. 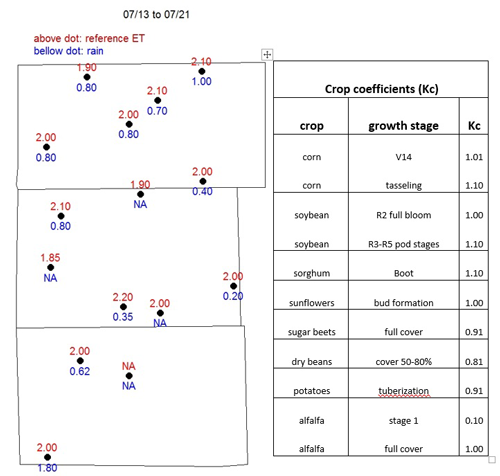 Crop coefficients for multiple crops and growth stages and ET resources for all counties are available at cropwatch.unl.edu/gdd-etdata and cropwatch.unl.edu/et_resources. Strahinja Stepanovic, cropping systems Extension Educator in southwest Nebraska: Isolated thunderstorms delivered 0.2 to 1.8 inches across the Upper Republican NRD. Reference evapotranspiration (ET) losses were 2.0 inches on average. To estimate crop water use on your farm obtain the weekly reference ET value from location closest to you (see Nebraska Agricultural Water Management Network ET resources) and multiply that value by crop coefficient provided in the table. Figure 5 shows ET values for three counties in southwest Nebraska. In wheat, harvest is 95% done! 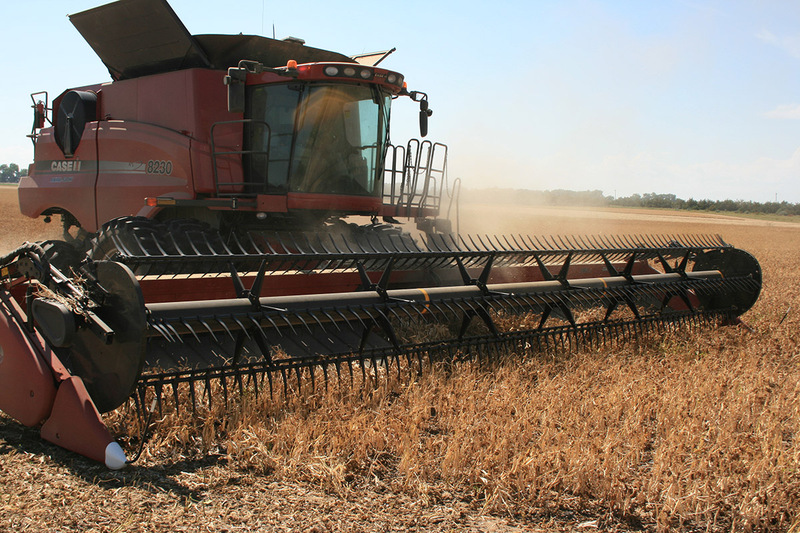 Dryland yields range from 20 bu/ac to 90 bu/ac. Farmers that had hard winter kill and didn't spray wheat for stripe rust had lover yield and lower test weight (53-55 lb/bu). Wheat kernels (Figures 3-4) diseased with ergot and/or Fusarium head scab have been observed. Although these did not appear to be a major yield limiting-factor, they can affect marketability of wheat seed. Loads can be rejected at the elevator if 0.05% of wheat kernels have ergot (about 0.5 oz/bu) or if over 1 ppm concentration of DON toxin has been detected in Fusarium-damaged kernels. Setting up your combine to blow out "chaffy" seed can take care of this problem. Corn is from V14 to tasseling growth stage. Adult western bean cutwormd have been emerging in the past week. 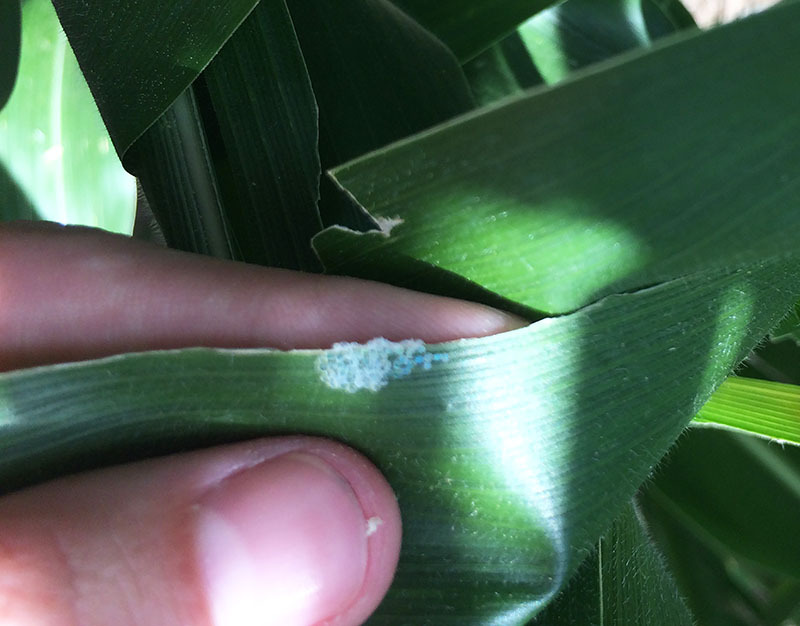 If 5-8% of corn plants have egg masses and/or small larvae, consider an insecticide application either through a center pivot irrigation system or by airplane. It may be beneficial to select an insecticide that controls both spider mites and western bean cutworm as mite populations are increasing in the area. For more information see this CropWatch article on western bean cutworm. Todd Whitney, Extension Educator in Hamilton County: Most corn is in the tassel stage, about two weeks behind normal. Rainfall last week ranged from 1 to 2 inches, moving from west to east across county. Most irrigators are in full-swing due to high temperatures and critical growth stages. 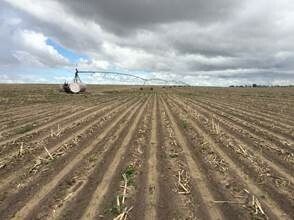 Drip-irrigators are applying fertigation. Some soybean irrigation is underway although it's still early according to soybean growth stages (just blooming, no pods yet) and UNL's soywater.unl.edu program. Nathan Mueller, Cropping Systems Extension Educator for Dodge/Washington Counties: The early season Washington County Crop Condition Tour was done on Tuesday June 9. 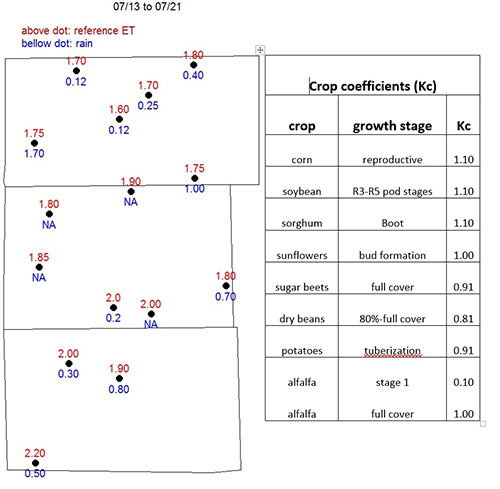 Corn growth and development ranged from VE-V6 stage. Overall the corn crop was in good condition, especially across the Loess Hills. Very poor to good conditions were seen in the Missouri River and Bell Creek bottoms, with poor conditions due to saturated soils causing reduced corn growth and stand loss. Corn has been replanted in some fields. 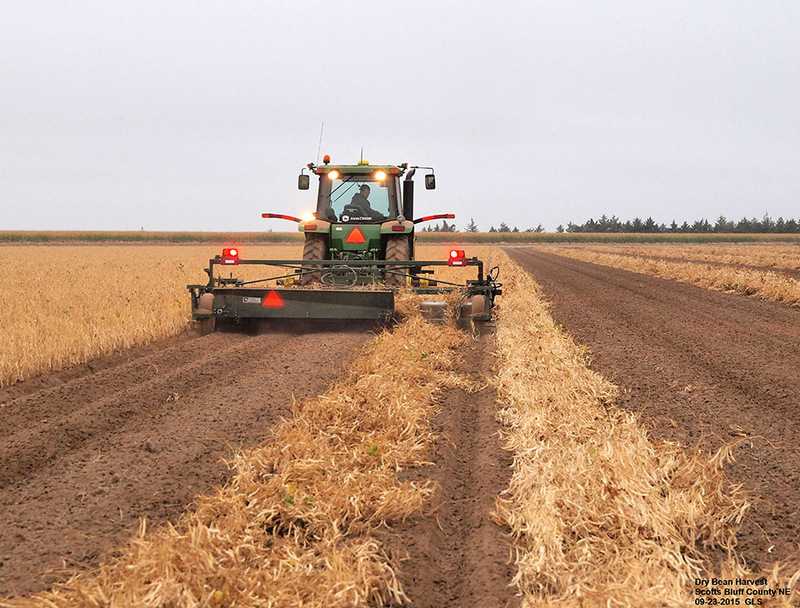 Strahinja Stepanovic, Cropping Systems Extension Educator in southwest Nebraska: With less than 0.5 inch of precipitation in the past seven days, fields have dried enough for farmers to continue planting and spraying weeds. Carefully assess field wetness! 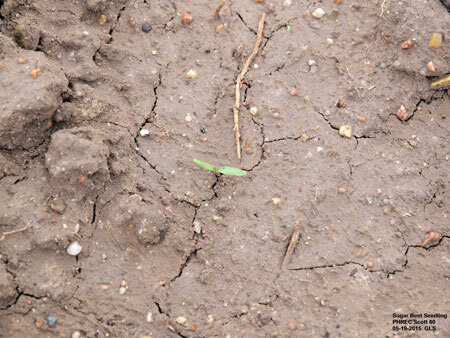 Planting in wet soils can cause severe crusting and problems with crop emergence, especially in soybean. Try to stay out of low and very wet areas of the field when spraying to avoid sucking in mud. Mark these areas with a flag so you can come back with a lighter sprayer (e.g., ATV sprayer) and do spot spraying. Water Management: Irrigating wheat is recommended to keep up with the water demand. On the 85-90°F days we had this week, wheat uses 0.37 inches per day, which is 2.59 inches per week. Wheat extracts water from top 3 feet, which means you need approximately 0.9 inches/foot/week to meet wheat water requirements. Most of our silt loam soils can hold 0.7 inches/foot at field capacity, which means wheat will start showing water stress at 0.35 inches/foot (50% depletion). In other words, irrigators on a typical soil in southwest Nebraska have an irrigation management span of 1 inch (in top 3 foot) to avoid water stress. In summary, you will need 2.59 inches on demand side and available soil moisture + rain + irrigation on the supply side of equation. Frequent irrigations of 0.5 inches are typically recommended to allow water infiltration and avoid runoff. 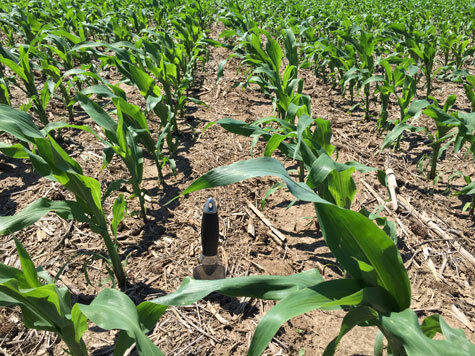 Probe or use soil moisture sensors to estimate what you already have in the soil get you in the ballpark. Wheat: Wheat is at flowering stage. Hail damage was observed in west Chase County. Stripe rust is moving north and is now observed in Perkins and Chase counties. Fusarium head blight (head scab) has not been observed yet, but treatment with Caramba and/or Prosaro is recommended to protect the flag leaf from disease. Check the Nebraska Extension resource, Distinguishing Between Head Disorders of Wheat (EC1872), to correctly identify head scab. Black chaff is a seed-borne bacterial disease that started showing up in fields where bin-run seed of susceptible varieties has been planted last fall. No treatment is recommended to control black chaff; planting a tolerant variety and certified, pathogen-free seed are the best strategies to prevent yield losses caused by black chaff. Potatoes in southwest Nebraska are at the flowering stage, presenting a bloom as beautiful as any from the tropics. The ability of field peas to close the canopy is amazing. Corn: Corn growth stages range from emergence to V4. Soil-borne diseases have been observed in southwest Nebraska; popcorn seems to be more susceptible than field corn. 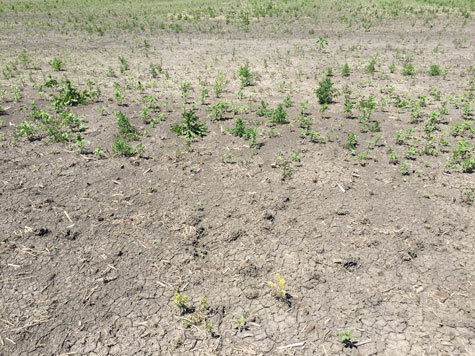 Assess your field carefully for stand reduction before deciding whether to replant. Economic threshold for replanting irrigated corn planted at 32,000 seeds/ac is about 18,000 seeds/ac (about 45% in stand reduction). As fields are drying out we see more applicators spraying weeds that have been growing wild in the past couple weeks. Amaranth spp. 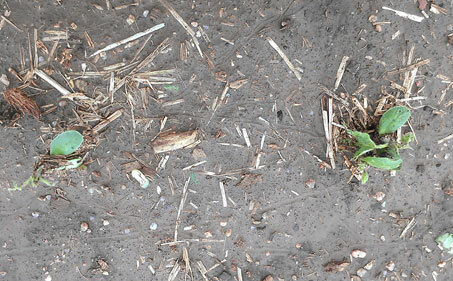 (pigweed species) started emerging. Other crops: Soybean are cracking and planting is about 55% done. 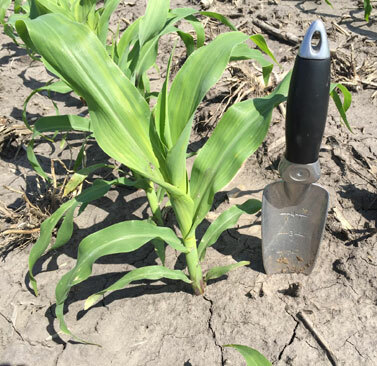 Planting in wet conditions can cause crusting in some areas. 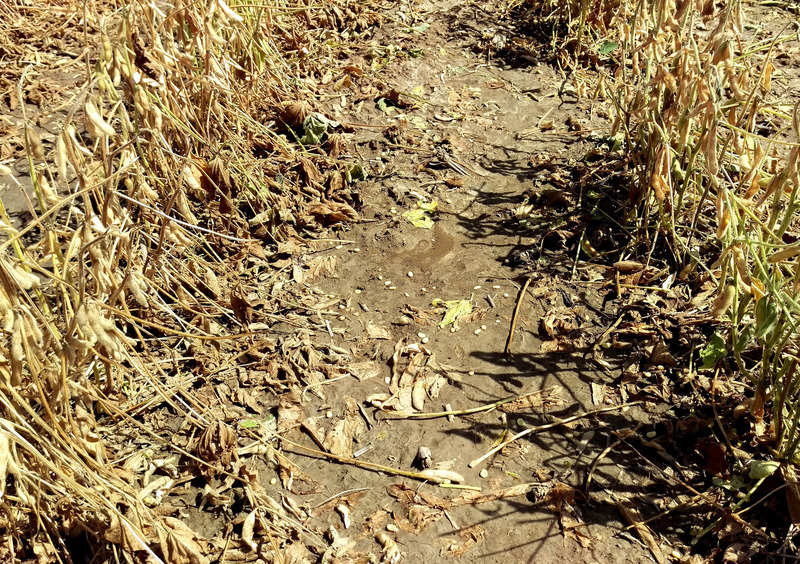 If soil is crusting, a light irrigation can be used to help soybeans crack through the ground. 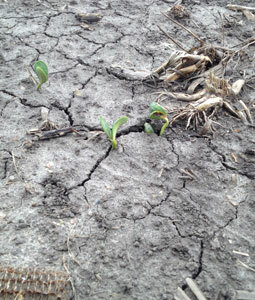 Grain sorghum is emerging; field peas, potatoes and sugarbeets are in good condition. Flooded fields in Clay County after heavy rains. Wheat has started flowering in southwest Nebraska. Strahinja Stepanovic, Extension Educator in Perkins, Chase and Dundy Counties: Wet conditions in southwest Nebraska continue to interfere with timely panting and spraying operations. Wheat is in good condition, with the exception of stripe rust being severe in some areas of Chase County. 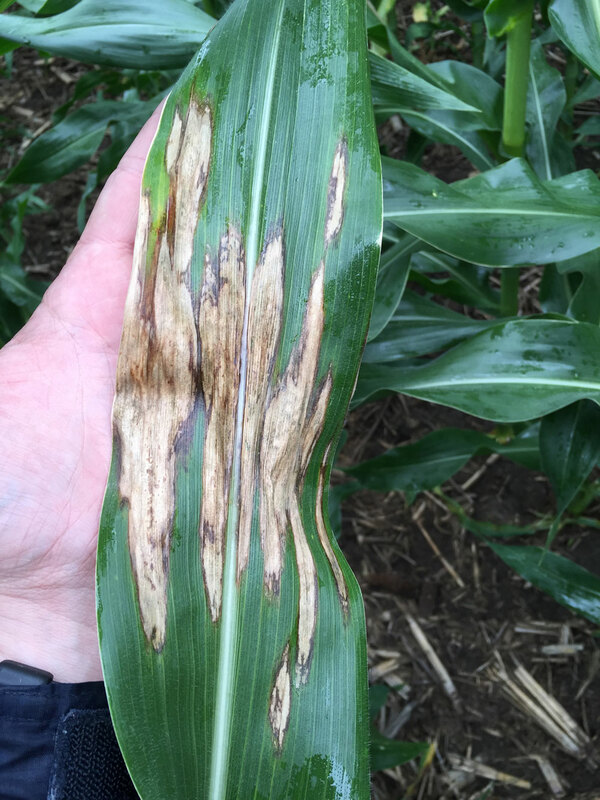 It's time to look at disease tolerance characteristics of variety planted last fall and consider preventive and curative fungicide applications to avoid catastrophic yield losses. Rain has also increased our risk for Fusarium Head Blight. Therefore, products that work well on both stripe rust and head scab such as Caramba and Prosaro can be used while wheat is at flowering stage. Soybeans in east central Nebraska range from emerging to V3 and VE or VC being the average stage. 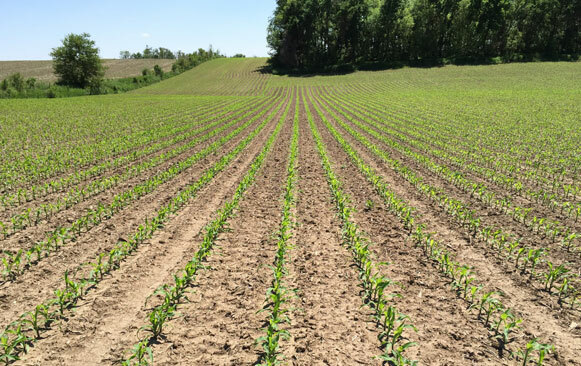 Nathan Mueller, Extension Educator in Dodge County: Based on a tour of fields in Dodge and Washington County over the last couple of days, corn is pretty much planted and some has been replanted. Some river-bottom land are too wet to plant. We have seen some damping off in corn, but at low rates (less than 1%) We're not seeing too many disease issues in soybean, but have seen a few bean leaf beetles, less than one for every five plants. Growers are taking their first cutting of alfalfa. Nathan Mueller, Extension Educator in Dodge County: Southeast Dodge County and most of Washington County received heavy rainfall (upwards of 2 inches in some areas) on Monday, May 28, bringing total rainfall to 7 inches in May. Corn planting is finished except for in some poorly drained fields in the stream bottoms. Corn growth and development range from germination to the V4 (four visible collars) growth stage. Unfortunately, corn seedling diseases have become an issue in some fields. 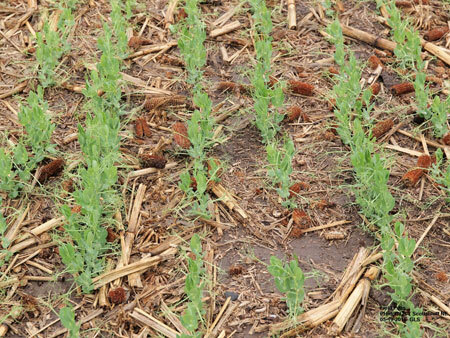 Wet conditions have hampered planting in some areas of southwest Nebraska. 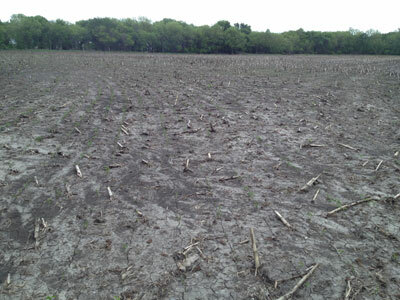 Strahinja Stepanovic, Extension Educator in Perkins, Chase and Dundy Counties: Precipitation of 3.5 inches in April and an additional 7 inches in May has been both a blessing and an obstacle for farmers in southwest Nebraska, where a variety of crops are grown. Following is a report on their growth stage and condition. Both dryland and irrigated wheat are heading and in good condition with soil moisture ranging from 20-40% of allowable soil water depletion. 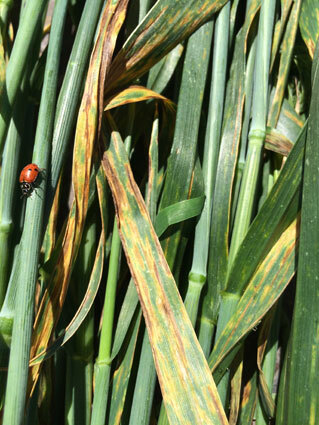 To my knowledge, there is no stripe rust in wheat fields here, but fungicide treatment is recommended to protect the flag leaf from stripe rust, Fusarium Head Blight (scab) or other infestation that may occur if temperatures increase in following weeks. 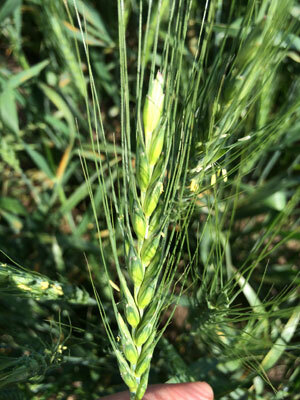 See information on wheat fungicide treatments in CropWatch. Todd Whitney, Extension Educator in Hamilton County: A few fields of wheat, mostly organic, are heading. With intermittent rains growers haven't had much of a chance to spray for scab. Corn planting is done, and soybeans are about 60% planted. Gary Stone, Nebraska Extension Educator, Panhandle Research and Extension Center, Scottsbluff: Last week's snow storm in the Panhandle damaged more than wheat. 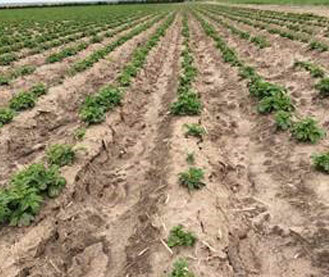 Approximately 2,400 acres of sugar beets have been replanted due to the freeze and snow. According to Jerry Darnell, Western Sugar Cooperative Sough Regional Manager, this year's sugar beet crop was off to the best start he had seen in years. The Nebraska Panhandle and eastern Wyoming sugar beet growers suffered the most damage while growers in northern Colorado and Montana had very little damage. About 15% to 20% of the sugar beets have had an herbicide treatment applied at this time. Producers are still assessing the damage to their winter wheat from the freezing temperatures and snow cover and will not know the full extent for several weeks. 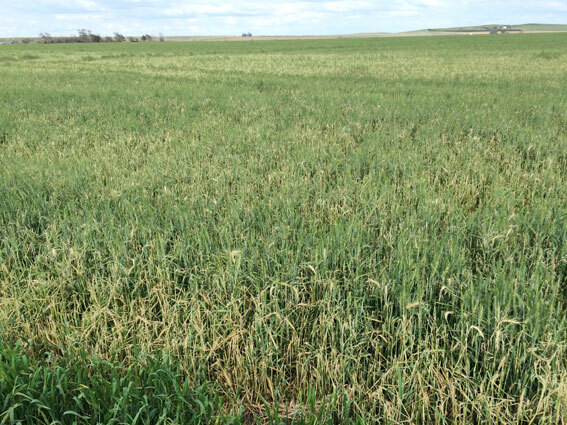 Producers have been bringing in samples of winter wheat with broken and crimped stems, reported Karen DeBoer, Cheyenne County Extension Educator. There were significant storms across Cheyenne, Kimball, Garden, Deuel, and Garden counties late Friday. There was a lot of precipitation and hail with these storms. Producers have yet to report any hail damage in those areas. 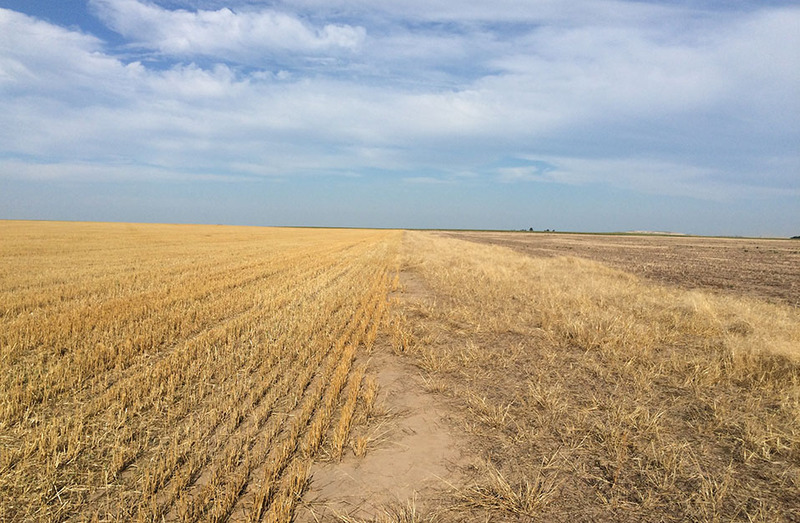 As the week progressed and more was added to this story, it was moved to panhandle-wheat-freeze-damage. 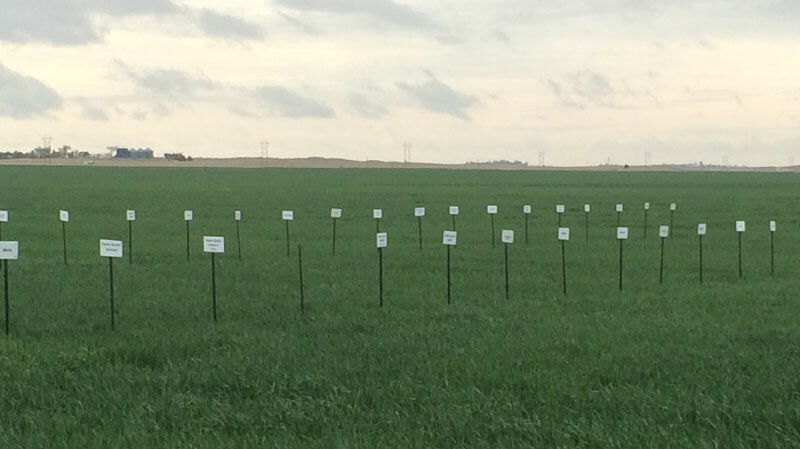 Wheat variety test plot at the UNL Henry J. Stumpf International Wheat Center near Grant has 50 varieties, all of which are in good condition. 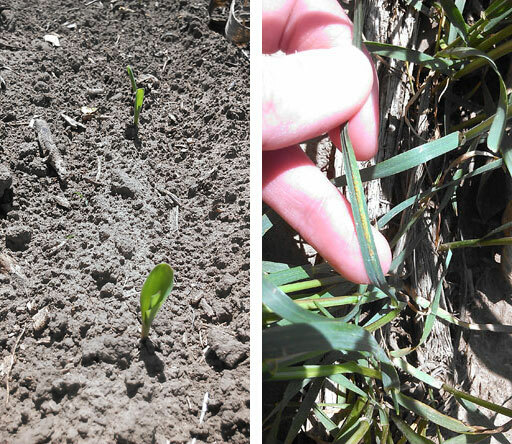 Corn emergence has been progressing nicely this week with the warmer temperatures. Little or no planting occurred however. A surprise thunderstorm (Figure 1) with hail moved through the area on Saturday, May 2, chasing many growers out of the field earlier than expected. We missed the heavy rains and severe storms on May 6 and 7. Rainfall totals from May 2 through May 7 ranged from 2.5 to 4 inches across the area, bringing rainfall totals to 6 to 8 inches since April 1. Flooding has only been a minor issue but ponding and waterlogged soils in river bottoms and upland potholes will reduce corn and soybean stands. The biggest concern is the forecast for heavy rain this Saturday night into Sunday delaying planting and causing flooding. Visit Crop Tech Cafe for additional figures and information. Strahinja Stepanovic, Extension Educator in Perkins, Chase and Dundy Counties: Wheat condition is 70% good and 30% very poor, so southwest Nebraska is in an "either-or" type of scenario. Significant moisture (about 3 inches) received in April made wheat look a lot better. Poor conditions are the result of hard winter kill that most probably occurred due to shallow planting that exposed young wheat plants to frequent ambiental temperature fluctuations and cold winds. In some fields wheat looks better in wheel tracks due to increased seed-to-soil contact. Varietal differences appear to be a minor factor contributing to disastrous winter kill! Test plot in Grant on the UNL Stumpf Family Wheat Research project has 50 varieties and all are in the good shape (see photo). Irrigated and no-tilled wheat seems to be in slightly better condition due to more moisture being available. Figure 1 (left). Good rainfall across Dodge and Washington counties on Saturday, April 25. Nathan Mueller, Extension Educator in Dodge and Washington Counties: Corn and soybean planting this week started off slow due to rainfall on Saturday, April 25, that averaged around 9/10 of an inch in Dodge and Washington Counties (Figure 1). The area around Uehling was on the light side with several tenths while fields around Fremont received as much as 1.6 inches. Corn acreage planted built on last week's progress before the rain. Soybean planting progress started to pick up the end of this week. 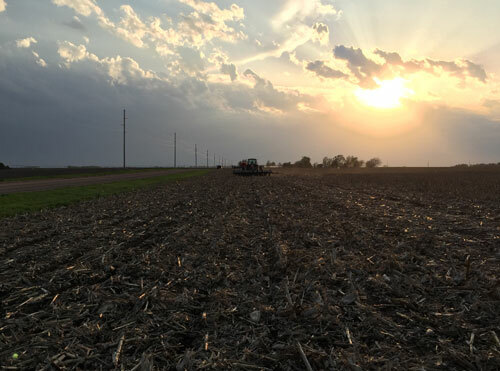 Overall, planting progress has been slowed in this part of the state due to an average to wetter-than-normal April with most areas receiving over 3 inches and some over 4 inches. Topsoil and subsoil have adequate to surplus moisture. Unfortunately, some tillage and planting operations ran across soils on the wet side as a result. 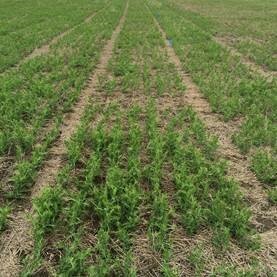 Last week's freezing temps (at or below 28° F) on April 21-22 did nip some alfalfa leaves (Figure 2), but overall the outlook for first-cutting tonnage looks to be good. Figure 3 (left). By the end of this week corn planted April 15 in Clay County was peaking through the soil in some fields or just able to be rowed. Jenny Rees, Extension Educator in Clay County: A large%age of corn in the Clay County area has been planted and soybean planting has begun or even finished for a few. Earliest planted corn in the March 28-30 time-frame has a good stand with minor cold damage to leaves. Corn planted April 15 is peaking through the ground (Figure 3) and in some fields can just be rowed. Corn planted the week of April 20 has germinated and we will see if there's any damage due to cold temps/rains in the future.